It’s the dead of night in the forest, with just enough light to illuminate the expanse of the surrounding darkness. A group of soldiers solemnly passes through a field, their weariness easily recognizable on their fading blue uniforms and collective downward gaze, and as the last two stragglers, who are obviously in no hurry, mosey past the camera, out come the most unlikely words for a bushy-mustached WWI soldier: “I, the blind girl...it may be the influence of the seasons, but I can tell I’m back in France.” Sung in the anachronistic style of 1960s pop-psychedelia (and by a singer of the opposite gender), the song chronicles the travels of a sightless French girl and her love of a young English lord—yet it also captures the spirit of Serge Bozon’s La France, a cross-genre hybrid of a musical and war film, and a folkloric narrative of cross-country journeys and separated lovers, featuring playful gender-bending performances. Even though the director (who also co-wrote the film’s four songs) resists calling the film a musical, its infectious melodies give La France its most irresistible charm, and provide a mystery even bigger than that of whom the soldiers are and where they are going. 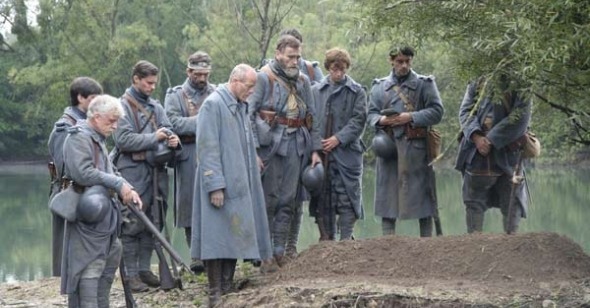 At the center of the film is not the band of soldiers, but Camille Robin (Sylvie Testud), a young wife whose husband, François (Guillaume Depardieu), is off fighting in the war. After receiving a letter from the front indicating that, “I don’t want you to write back to me, you’ll never see me again,” Camille chops off her hair and disguises herself as a young boy before wandering the forests, never quite sure of her location or even even her intended destination, in search of the war. The early days (or are they weeks? hours? The film’s lack of temporal guidelines is but one of its many semi-hallucinatory qualities) of Camille’s journey are captured in a few swift shots, characteristic of Bozon’s economical-but-evocative style: Camille on a path at night; Camille cracking walnuts barehanded by day; Camille at dusk on a path that leads her to the wayward soldiers, whom she hopes will guide her to her husband. Unknown to her, however, is the fact that the soldiers are deserters, and they are leading her away from the front instead of towards it. Led by their lieutenant (Pascal Greggory, who, in a quiet but commanding performance, offsets his character’s terse, Hemingway-esque dialogue with the delicate movement of his eyes and lyrical turn of his grizzled chin), the soldiers seem almost mythological: their chit-chat belies the specter of war with talk of food (“Pour the batter on the Montmorency cherries…a real clafoutis needs Montmorency cherries,” explains one soldier) and exchanges of poetry and prose. And their endearingly rustic instruments—tin-can fiddles and ramshackle guitars—are accompanied by a cacophony of voices whose lovingly out-of-tune harmonies are surpassed only by their unshakable sincerity. Bozon’s decision to record all the songs on-set by the actors while the cameras were rolling is one that will hopefully inspire legions of followers (or at least a few). Whereas the traditional musical (Fred Astaire, for example, or any of the other Hollywood archetypes) emphasizes the body of the performer—requiring actors lip-synch so they can concentrate on choreographed movement—La France shifts the focus to the performance itself: stationary, the actors’ focus is not on mimicking a prerecorded song, but in the organic creation of one on-screen. La France inhabits a world of magical realism: songs are codes to pass by sentries, and bodies have an ethereal weightlessness that seemingly allows them to float (as when the whole band of soldiers take to the trees to hide from a passing stranger) or disappear (as when Camille, momentarily suspected as a spy, is able to slip through the circle of soldiers undetected while clouds obscure the moonlight). More than just blurring the line between realistic and fantastic, Bozon uses these seemingly contradictory binaries as formal strategies throughout the film: the cinematic and the theatrical (tableau-style shots reminiscent equally of early cinema as the stage); the naturalistic and the artificial (by daylight the forest radiates unadorned beauty, while at night the deliberate lighting reveals the artistry of cinematographer Céline Bozon, the director’s sister); and even the narrative seems to be divided into alternating daytime and nighttime scenes—the only distinction in what appears to be a never-ending journey. The most significant distinction (or lack thereof), of course, is one of gender: Camille passes as a boy, while the male soldiers sing of being a blind girl. These malleable gender identities are part of a larger issue of transformation in La France, which primarily manifests through the soldiers’ use of anachronistic songs. The modern music becomes, in a sense, a realization of their dream of escape: while in reality they are struggling to cross borders and evade the war, through music they are able to traverse not only borders but also time and space. (The most literal scene of music-as-transportation occurs when, upon approaching a sentry, a soldier begins playing a mini-glockenspiel of sorts, which initiates their passage.) Just as pop-psychedelia is their vessel into the future, so is the myth of Atlantis their entry to the past. The company’s particular fascination with that ancient tale began with Philippe, a soldier with adoration for history, who re-told the story of Atlantis as a way of escaping his immediate confines. Before he perished in battle, he stopped rhapsodizing Atlantis—proof that to his fellow soldiers he was already dead. The story of Philippe, in turn, turned into a myth of its own—a call to arms for defending one’s soul, which became the new mission for the lieutenant and his troops. The only non-original song to be used in the film is Robbi Curtice and Tom Payne’s “Gospel Lane,” a haunting gem from the late Sixties recorded with only acoustic guitar, piano, organ, and Curtice and Payne’s polyphonous vocals. Stripped to its primary elements, the recording has the rawness of a bedroom demo but the sophistication and artistry of a fully fleshed-out arrangement. It begins to play over what is to be the final shot of La France: a starry night outside the reunited Camille and François’s window. Any sense of sentiment or hope is undercut by Curtice and Payne’s desolate lyrics: “Here in my room I can hear people cry, and the old down and out would turn their eyes and watch the sky and wait to die…” The lyrics recall the Lieutenant’s repeated cryptic words to Camille: “You just want to die.” More than just turning a clichéd shot on its head, the juxtaposition of music/image illuminates a crucial sense of dignity in the soldier’s desertion (and that aligns it with Philippe’s mythology): their hope lies within their journey and its seemingly unreachable destination (Holland is their Atlantis). This notion of “the unattainable” is part of the mythological conceit of the film. Undeniably romantic, La France is also admirable in its rejection of complacent reality and embracing of fabled idealism.